Until you embark upon parenthood, you don’t quite realize how many decisions you have to make. From seeing those 2 lines appear on the pregnancy test, you begin to make decisions: what will the baby be called? What stroller should I buy? Whilst we can’t help you with the first question, our extensive research will tell you everything you need to know about choosing a stroller for your baby in this Top 10 Baby Strollers Review. Already a parent looking for a new product? Requiring a double umbrella stroller? This guide is for you too. Decision-making is tough; there are so many products available and reviewing each one can become a daunting and onerous task. Here at Stuffoholics, we’ve done all the hard work for you so take a stroll through the reviews and you will feel confident about your choice! Which Type of Stroller Suits Your Lifestyle? I remember purchasing my first stroller when I was pregnant with my first child; I had no clue where to begin and was so confused by all the different products available. In the end, I relied upon other parents that had been in my situation – people that had tried and tested all sorts of strollers with their own children and I listened to their reviews of them. If you’re someone like me, let me convince you why you should put faith in our reviews. Here at Stuffoholics we have lots of experience in methodical product research and have reviewed products for over five years. To date, we have spent over 72 hours researching baby strollers and have involved many people in the process. We pride ourselves on neutrality: we have made sure to eliminate any subjective or biased reviews and have included many brands in our research. Therefore, we can assure you that the reviews we have provided are not biased in any way and we do not promote specific brands. 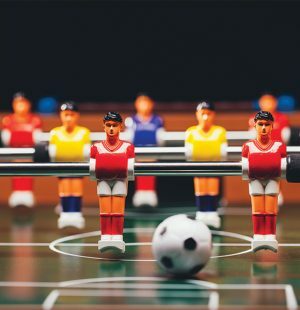 Our sole purpose is to help you choose the product that best meets your requirements. In order to compile our Top 10 Baby Strollers Review, we looked at more than 8 different brands and over 35 different products. We narrowed them down to a top 20 before selecting our final top 10 to appear in this review. Our Top 10 Baby Strollers Review is for all types of users from first purchases, professional use (i.e. childminders) and even strollers for joggers. Whatever your requirements, this Top 10 Baby Strollers review is for you. Where to begin? There are many important factors to consider before choosing a baby stroller. Perhaps the most obvious factor to consider is who the product is for. The range available is huge – and rightly so – because we all have different requirements and needs. Is it newborn friendly? 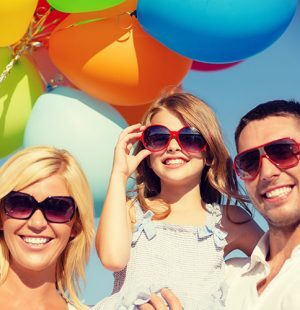 Essentially, you need to consider the weight and age of your child, not forgetting the weight of any additional items like a diaper bag or shopping that you would put into the stroller. Furthermore, some strollers are only suitable for children over six months of age. If you are intending to run errands and do shopping whilst out and about you should also consider the size of the storage and whether a parent tray or a child tray is essential. The size and weight of the stroller itself is also something to consider. If your car’s trunk or your home isn’t very big, or like me, you have a number of steps to climb up to your property, you will probably want to look for something small and lightweight. Is it quick and easy to fold? Is it self-standing once folded? Another point to consider is ease and comfort to you as its user. Consider the length and terrain of your journeys. Are you likely to want something that can cope with uneven ground or will you be using it mainly on sidewalks for short trips? 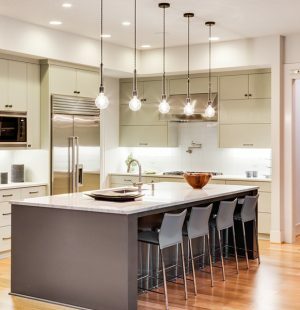 You may also want to think about the handle and whether it adjusts, especially if you are above-average height. It would be a good idea to take a test and try pushing a few strollers to see what is comfortable. Think about your child’s comfort too: does the seat recline for naps? Is it suitably padded for long trips? Are there any parts that are sharp or pointy? After all, your child will soon let you know if they’re not comfortable, and that’s no fun for anyone! It goes without saying that you want your stroller to be safe and protective for your child. When it comes to safety, what could be more important than the brakes? The most commonly seen brakes operate with a foot pedal but newer models and more particularly, running models, have a variety of braking systems. All strollers should have an appropriate restraint to keep your child secure and unable to fall out. A five-point harness is the most secure, securing the child at the waist, between the legs, and over the shoulders. Correspondingly, your child shouldn’t be able to access the brake when they are in the seat. Protecting your child from the elements is an important factor to consider too. Even if you’re not in a particularly hot or sunny place, you will want to ensure the stroller’s canopy is effective for your needs. Finally, if you are intending to jog with your stroller, it is important to make sure you choose a stroller for joggers as standard strollers are not designed for such activities. Why Do You Need a Baby Stroller? Of course, there are other ways of moving your child from A to B but a stroller for your baby can make your life a lot easier. Not only will a stroller help you transport your child, but it will provide a dedicated space that will keep your baby comfortable. At the same time, your hands will be free to do other activities without hassle. What’s more, most strollers nowadays offer ample storage for your belongings too. Children come with all sorts of paraphernalia such as snack, toys and spare clothes! A stroller with good storage means you can carry all of these things with ease. One of the things I miss the most when I go shopping without my children is a place to put all of my shopping! Strollers with large storage spaces are ideal for running errands and getting groceries with your baby and allow you to stay hands-free without any hassles and without having to carry heavy items long distances. Many parents with a newborn prefer to have a stroller that is parent-facing so that they can keep an eye on their child. Babies will also feel more secure if they can see their parent. Your baby is always seeking your attention. You can give him the attention he wants with a parent-facing stroller. Thus, you can go about your daily business and give your precious little one the attention he deserves. Many strollers offer the possibility to change from parent-facing to world-facing as the child grows and once babies can sit upright (from about six months old) they may enjoy seeing and hearing things around them, particularly in interesting and new places. Enjoy keeping fit? Jogging with your baby is a great form of exercise and specialized jogging strollers mean you can enjoy working out whilst caring for your baby. Older children, in particular, love the exhilaration of a fast ride and pushing a stroller whilst running will give you an added workout too! “Mummy please carry me, I don’t want to walk!” Yes, you heard it right. Walking can be tiring for children. Their young feet and small legs get easily tired and they often can’t keep up with us or cope with the distances we need to cover. A stroller is the perfect solution to more enjoyable moments for everyone. Your child can still explore their surroundings whilst sitting comfortably and can easily take a nap on the move. One last thing to note: I have changed a diaper in many strange locations – babies seem to know when it is the most inconvenient time to poop! A stroller with a flat reclining position allows you to change your baby’s diaper with ease and is easier than getting down on a floor! Your lifestyle is an important factor to consider when choosing your stroller. Someone looking for a stroller suitable for infrequent use will have different requirements than someone who spends a lot of time outdoors on rough terrain. Make the right decision that fulfills your requirements the most. This is the most common type, a multipurpose stroller with all kinds of facilities. They are often suitable for newborn age right through to toddlerhood. Standard strollers come in many shapes, sizes and weight limits and they usually have wide, padded seats, have the ability to recline and come with good canopies. These are specifically designed for a multi-terrain activity like walking or jogging. Usually, this type of stroller has three big bicycle wheels that maneuver smoothly with less jarring. They are often easy to push and turn and very responsive. Due to the nature of their usage and their wheels, jogging strollers are typically larger. Double jogging strollers are also readily available. Even if you only use a stroller occasionally for jogging, these strollers are excellent for standard use too. My jogging stroller became the stroller I used most frequently simply because I loved how responsive it was. Travel systems are popular with people who often use a car. They can be customized easily and you can buy as many parts as you need. They can be used with a carrycot (for newborns), a seat or a car seat. Have you heard the phrase “never wake a sleeping baby”? The ability to install a car seat on your stroller means you can easily transfer your baby from your car to the stroller without disturbing him. The seat units that come with travel systems can usually parent-face or world-face. One downside of these strollers is that you often have to separate the seat from the chassis before folding it down, thus they take up more time and space. Useful for twins or young siblings of different ages, these strollers come in two formats: side-by-side and tandem. The side-by-side double stroller allows both children to see their surroundings equally and both children have equal space. Tandem strollers, where one child is sitting in front of another, have their narrow width as an advantage. These strollers often have the possibility of fully-reclining one of the seats, making it suitable for a newborn. Also, you can often attach a car seat in place of one of the seats so you can move your baby more easily. To select which strollers to test, we went through over 11000 user reviews of different products to determine the important features that the users need, look for and got from the products. We analyzed over 25 different products each of different styles and with different features. With the 20 strollers we shortlisted from the researched products, we visited their websites and read their product user guides. 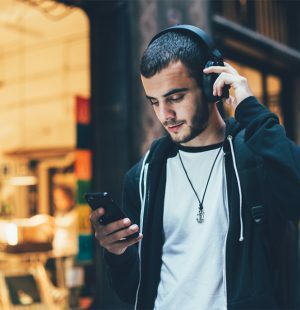 We read their descriptions on different store pages to determine the features that each product usually has and read through individual critic reviews. In all, we analyzed and researched more than 10 different brands and carried out a side-by-side comparison of their features. We matched our volunteers’ final reviews against the research data we found on the web and with all this data in hand, we selected our top 10 products. Without further ado, we are now ready to present to your our final verdict. You will be pleased to see our Top Ten Products feature something for everyone! We considered 20 of the most important features of all the strollers that we tested. We took the features from each product’s manual and specification to provide analytical results, which helped us to shortlist the ten best strollers of the 25 we tested. Cost is an important factor to consider when purchasing a stroller so we looked at the pricing to find the value per dollar of each product and its features. Similarly, we have considered each product’s lifecycle so we can determine how sturdy each product is and if the build quality is made to last or is more suited to casual use. We are, therefore, entirely confident that our Top 10 Baby Strollers Review provides an accurate reflection of the best strollers of 2018. Our research report is available for you to read to help you choose the most suitable product for you. Before I jump into the review of this product, let me tell you why we have chosen this as our Top Pick. 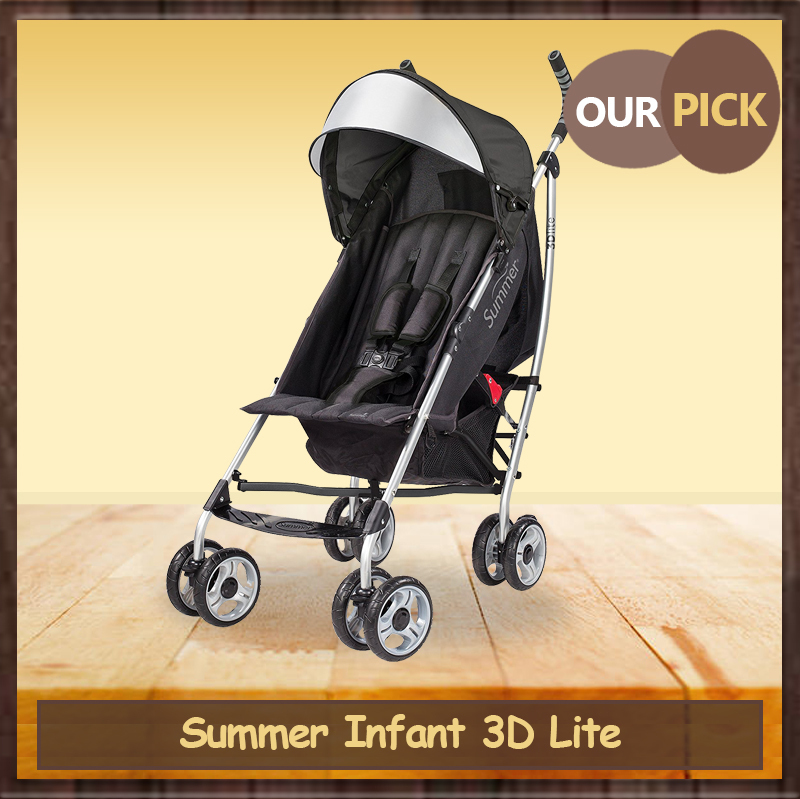 The Summer Infant 3D Lite is a nifty stroller with a lightweight frame and spacious seat for your little tot. It also stands out for its affordability and comfort factor. From all the products we have selected, we analyzed 21 different features. This product is our Top Pick because it has a larger number of positive features (14), making it the niftiest product in its price range. The price of this product is below $80.00 which is below the average price of $121.00 of similar strollers in the market. This product has the highest number of reviews among all the strollers on Amazon. It had received its latest 10 reviews in the space of 2 days, the previous 10 reviews in 2 days and the 10 reviews before that, within 2 days. By this, we can assume that a lot of people are buying this product and they are positive about it. The stroller has 4 plus average ratings which indicates satisfied users. This stroller comes in 8 different colors, no other stroller gives you that number of options. The weight of this stroller is below 16 lbs., which is also below average compared to other strollers in the market. The average weight of similar kinds of stroller on the market is around 20 lbs. With ample storage, a carry strap and cup holders, you really do get value for money with this stroller. With its dimensions of 41 x 8.8 x 10 inches, the Summer Infant 3D Lite Convenience Stroller really measures up to everyone’s expectations! It is a compact-fold stroller that weighs in at 15.87 lbs. Its air-light aluminum frame is lead-free and it can also hold a child weighing up to 50 lbs., which is above the average weight of an American four-year-old. Thus, it has plenty of capacity for carrying your child as well as your shopping. Fussy about color? You are really spoilt for choice with the 8 options this stroller. It has the best range of all of the strollers we reviewed. The Summer Infant 3D Lite Convenience Stroller has multiple reclining positions and a large canopy with a pop-out sun visor. There is also an adjustable calf rest as well as a footrest. We are confident, therefore, that this product will provide the greatest comfort for your child. Many reviewers comment on the comfort of the contoured-foam handgrips. Thus, we are confident that both you and your child will have optimum comfort with this Pick. This stroller has a 5 point safety harness and has 6-inch anti-shock front wheels, which you can lock into place. Collapsing the stroller requires 2 movements: the releasing of the safety lock lever whilst pulling the folding handle, making it a secure stroller. The 3D Lite Stroller has ample storage for your belongings. As well as its large capacity storage basket below the seat, there is a storage pocket behind the seat with a hook and loop closure. This stroller boasts the additional features of a cup holder for parents as well as a carry strap. The manufacturers have certainly thought hard about what parents need with this product! You get a lot for your money with this stroller. 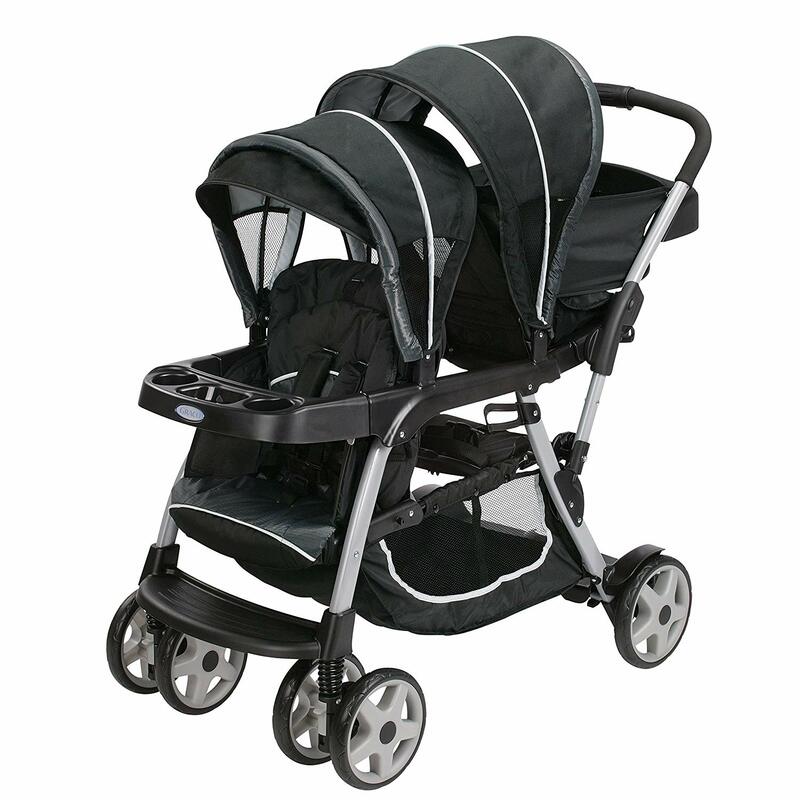 It comes in well below the average price of similar strollers but has many additional features. There is a 12-month manufacturer’s warranty too. This convenience stroller is a good all-rounder and its pros definitely outweigh its cons. For something that is so lightweight, it is incredibly comfortable for both child and parent. If additional features are something that is really important to you, you won’t be disappointed. Why is this product our Smart Pick? The Graco Roomfor2 Stroller is every practical parent’s dream come true, with is multifunctional features such as car seat attachment, rear and front-facing options, and can be used from infant to toddler stage. This product would be a smart choice for parents who like to think ahead. If you already have a child and plan to have another child within a couple of years, this stroller is for you. Perhaps you don’t have a stroller for your preschooler and are expecting another baby. Unlike regular double strollers, this stroller is unique in two aspects: its front-back seating gives you a narrower design and it can accommodate older children. It will give you the experience of using a single stroller whilst pushing both of your children. The second seat is detachable, allowing you the versatility of converting into a single or a double stroller. You can also replace the front seat with a car seat. The front seat is suitable for the youngest child while the rear bench seat is perfect for your older child. As a fun alternative, he or she can opt to stand on the sturdy platform. With these possibilities, this makes it by far the smartest choice for parents and would be parents of more than one child. This compact tandem stroller weighs in at a light 11.8 lbs. and measures 31.2 x 18 x 39 inches. As all parents know, children are prone to making a mess. Our Smart Pick has polyester seat cushions that can be removed for washing – perfect for those spillages and diaper accidents! Additionally, each seat holds up to 50 lbs. meaning you will have many years of use from this stroller as your children age. Your child will nap with ease in the reclinable front seat. The Graco Roomfor2 offers multiple recline positions, including fully-flat. Your older child will appreciate the padding of the rear seat while your younger child will be safe from the elements with the canopy in the front. The front seat has a harness that can be converted from a 5 point harness to a 3 point harness to cater for growing children. The rear seat offers a 3 point harness. If your child is using the standing platform, there are riding handles to give your child more stability. The swivel wheels have suspension and can be locked into place, allowing you to adjust the maneuverability of your stroller on different terrains. The manufacturers have clearly thought about busy parents of two when designing this stroller; it can be folded with one hand and locks into place. You will love the storage features on our Smart Pick! The storage basket is large and sturdy, with enough room to store everything you need on the go. There is also a parent tray with a cup holder and places to store a wallet, phone or keys. The front seat also has a storage tray for your child which is ideal for drinks and snacks. This tray swivels entirely to allow easy access in and out of the stroller. Our Smart Pick has a price tag of just under $110.00, which makes it very affordable if you look into this Top 10 Baby Strollers Review. Even so, this price tag is pretty steep compared to our top pick, bringing it to the second spot. On the other hand, it has the highest ratings of all of the products. Not much space in the rear seat when using in car-seat mode or if the front seat is reclined. With 11 great features, including the extra seat and possibility of attaching a car seat, this is a smart option for parents who want flexibility with their stroller. You get a lot for your money too despite its higher price. Why is this product Best for Twins? The Delta Tandem Stroller is the perfect stroller for dynamic duos. It is affordable, lightweight and compact, making it easy to lug around and store, plus Delta offers free parts replacement. Although our Smart Pick offers versatility, it would be more suited to older and younger siblings and not twins, due to its front-back design and different styles of seats. This pick, however, would be a better choice for parents of twins because it’s economic in the sense that you wouldn’t have to go out and buy two strollers. Compared to other umbrella strollers, this one wins due to its price rating and positive features. With a side-by-side design, this stroller allows you to watch both twins at the same time and gives each child the same ride experience. If you enjoy visiting places with things to look at like a zoo, a side-by-side stroller means there is nothing restricting your children’s view. Personally, I love side-by-side strollers because of this! 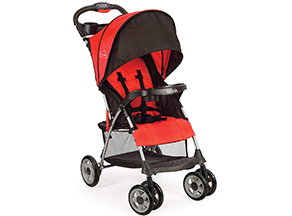 This stroller has the second highest average rating (4.4) coming from around 800 reviews. Many customers like this stroller since the price is almost like that of a single stroller. Since you will be pushing both of your children at once, weight is an important factor to consider when purchasing a double stroller. This pick’s lightweight frame only weighs 19lbs. Each seat can carry 35lbs., which is lower than some of the other products we reviewed but still more than adequate for your needs. In terms of dimensions, our Best For Twins Pick measures in at 29.9 x 23.4 x 37 inches, fitting through a standard 30-inch doorway. 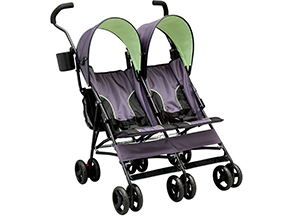 It also comes in 4 different color options, giving you a choice that you don’t often get with double strollers! This stroller has multiple reclining positions and has a double canopy for protection from the sun (although some reviews state this isn’t big enough). Due to its low seat height, the stroller might not suit children who are of above-average height. The stroller has shock absorbing front wheels that swivel. Each wheel has a separate brake pedal. Unlike our Smart Pick, the Best For Twins pick has 5 point safety harnesses on both seats, meaning you can relax safe in the knowledge that both of your children are as secure as can be. This stroller also has a compact umbrella fold. Although there isn’t a storage basket on this double stroller, there are two large hanging storage bags and you still have the facility of a cup holder for parents. Reviewers like the decent footrest that this stroller offers; thus, you can be sure your little ones can put their feet up and enjoy the ride! Twins don’t mean double the price with this pick! In fact, compared to other similar double strollers, this one wins with its affordability. Customers like the product too; there are lots of positive reviews and a high average rating of 4.4. You can also get the added bonus free replacement parts with this stroller! Finally, it is the only stroller of all of the products we reviewed that is JPMA certified and meets or exceeds ASTM and CPSC standards. You can be sure to trust the manufacturer with this one! This is a great and affordable product with lots of positive features. It is ideal for parents of twins looking for a side-by-side stroller that is compact and portable. In our opinion, it is well worth the money. 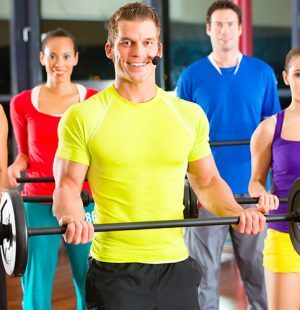 Why is this product Best for Joggers? This heavy-duty jogger stroller is perfect for parents who like to stick to their running routine even when caring for their young child. It is durable and relatively easy to fold, and offers optimum comfort to your child while you jog. Fed up of running around after your little one? Run with them instead! This is the stroller for you if you’re looking for something suitable for combining jogging with looking after your child. As with our Top Pick, in our research, we found 12 great features. It has the third highest average rating, coming from more than 1000 reviews. Looking at the frequency of reviews, it is clear to see that the product is very popular and people are buying it frequently. Whilst the other strollers in our list come with 4 wheels for stability, this jogger stroller comes with three highly maneuverable bicycle-style wheels and greater safety measures. Due to its extra-wide, ergonomically-shaped rubber handle, joggers experience better maneuverability and comfort. With a price of around $90, this stroller makes it very affordable in comparison with other similar strollers in the market. In addition, it has a special feature: a very convenient covered compartment, suitable for holding keys and a smartphone whilst on the move. You can also use this stroller as a travel system by connecting a car seat. Thus, this product made it onto our list as the best stroller for joggers. The lightweight rugged steel frame of this jogging stroller weighs in at 27lbs. The seat holds a child up to 50lbs, meaning you are able to continue jogging as your child grows. As well as using the seat it comes with, you can attach an infant car seat with a one-step maneuver. You are spoilt for choice with its 5 color options too. The seat reclines with the squeeze of a handle on the back of the seat and offers multiple positions. There is a large canopy for protection against the elements. The padded seat provides extra comfort for your child whilst you’re running over bumpy terrain. Your child’s safety is obviously important no matter what stroller you are considering. However, it is even more pertinent to consider safety when you are moving and maneuvering at speed. This stroller has a convertible 3 or 5 point harness. 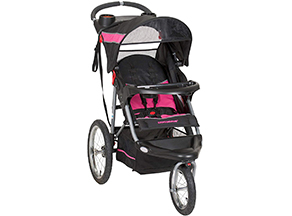 It is possible to lock the front swivel wheel into place for an easy switch between strolling and jogging. The air-filled rubber tires make the jog extra comfortable for your child. Although somewhat larger when folded that some other products in our Top 10, this stroller has a one-second, one-handed fold, which is ideal when transferring to car or home. It locks automatically when folded and stands freely. Finally, there are reflectors for low-light visibility. You will not be disappointed with the storage on this stroller! The handle features a tray with a cradle for a phone or MP3 player and 2 cup holders. There is a covered storage compartment too. The stroller also incorporates a footrest and a convenient storage tray with two cup holders for your child that swivels and removes completely. There is the addition of a carry strap to make transporting this stroller even easier. In comparison to other strollers in this Top 10 Baby Strollers Review, this jogger stroller is affordable at around $90 and comes with a 12-month manufacturer’s warranty. It has an average rating of 4.3 coming from over 1000 reviews, meaning that many customers rate this product highly often. This stroller combines all the features that you need from a regular stroller with the function of a multi-terrain jogging stroller. It really is multipurpose and you may find yourself using it as your regular stroller! I know I did with mine! This Kolcraft stroller is a great option for parents who want good quality and stability at a very affordable price point. It is lightweight yet durable, and won’t compromise your child’s comfort & safety. Looking for something on a budget? This travel-friendly stroller’s price is just around $60 making it one of the most affordable products on our list. Budget doesn’t mean poor quality; from among the 21 strollers we have reviewed, there are far cheaper alternatives. When considering the build quality and the other positive features, this one gives you more value per dollar. Despite the cost, it has all the essential features that a standard stroller needs. It has 12 positive features, which is only 1 less than all the other picks. With its 4+ rating of around 650 customer reviews, it made it to the fifth spot in our list. From our research, we have found that the review frequency for this product is high, meaning people are buying this stroller frequently. At only 11.8lbs., this stroller is one of the most lightweight. It also has a large, accessible basket to hold all of your little one’s needs for a fun-filled day. The compact fold of this stroller measures in at 18 x 12 x 34 inches and 18 x 31.25 x 34 inches when assembled. Its lightweight design favors easy transportation and does not stop it having a good build quality, with the seat being able to accommodate a child up to 50lbs. There are 2 color options with this product. The multi-position reclining seat is cozy and comfortable for your child and your child can sit very upright giving them a good view of their surroundings. Likewise, you can keep an eye on your child through the window on the canopy! The handle is a good height, even for taller parents as is the seat height for your child. Safety isn’t compromised with the low-price of our Budget Pick. Your child will remain safe and secure in the 5 point harness and with all-terrain wheels, he won’t be jarred by uneven ground. The wheels also have front suspensions to give a smoother ride and lock into place. You can fold this stroller with one hand, although many reviews commented that it is necessary for the wheels to be locked first to ease the folding of the product. It has the added bonus of being able to stand freely once folded. Budget doesn’t mean you have to compromise additional features either. Our Budget Pick has many! The storage basket under the stroller is large and easy to use. There is also a parent tray with two drink holders and extra space for storage. The child’s tray is removable with 2 cup holders. As well as a one-year manufacturer’s warranty, this stroller is JPMA certified. There are cheaper similar strollers out there, but with this one, you get much more for your money. It has a 4+ rating from over 600 reviews and is reviewed frequently meaning people are buying this product often and are very satisfied with their purchase. For those on a budget, or wanting something for grandparents or for vacation, this is the product for you. It’s easy to use, lightweight and doesn’t compromise with its safety or features. Parents who often travel with their young ones will definitely love the super compact, lightweight, easy to fold and use Pockit Lightweight Stroller. It is easy to carry and will easily fit an overhead bin for easy access when traveling. If you are looking for something so compact it could fit into an overhead locker on an airplane, this is the one for you! In fact, this stroller is the 2014 Guinness World Records’ most compact stroller and it folds down to a tiny 11.8 x 7 x 13.8 inches. The frame is lightweight and made from aluminum. In fact, it also only weighs 9.5lbs meaning it is lighter than carrying your child around! Light and compact doesn’t mean it is not strong. 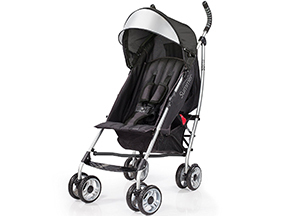 In fact, it has one of the biggest capacities of all of the strollers we reviewed and it can take up to 55lbs. The basket can store a further 11lbs. too, meaning it is very durable. The six color options are a great bonus too! Although it does not recline, the Pockit provides a good height for your child meaning it is suitable for taller children. The sun canopy is basic however and is not enclosed at the sides. The extremely compact fold can be achieved single-handedly, which is excellent for boarding a plane when you need to hold onto your child. They remain nice and safe once disembarked too as you won’t have to wait until baggage reclaims for your stroller! Unlike other strollers, the handle on the Pockit is telescopic and so when extended it does have some give in it that makes it feel a little less sturdy to push. Despite its neatness, it still has a storage basket and this is accessible from all sides. There is also footrest for your child to support their weary legs. Given its lightweight and compact design, this product would definitely benefit from a carry strap, which unfortunately it does not have. The good reviews on this product speak for themselves, it has a rating of 4.5 from almost 600 reviews. However, this is one of the more expensive products in our Top 10 Baby Strollers Review, costing around $180. 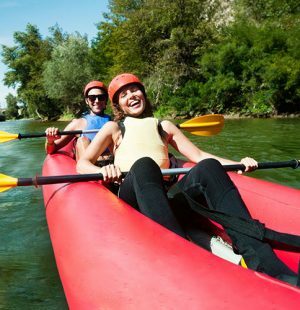 Enjoy lots of day trips or overseas travel? This stroller is perfect for your needs when compared to the other products in this Top 10 Baby Strollers Review. The fact that it fits in an overhead locker means you won’t be waiting until baggage reclaims for your stroller at the end of your journey. If you’ve ever arrived at an airport late at night or after a long flight, you will truly appreciate this! 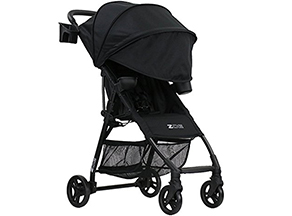 This stroller from Zoe combined comfort, style, and function with its cushioned and fully-reclining seat, large canopy that protects against the sun and rain, and stable frame that doesn’t tip even with heavy diaper bags. The number 7 in our Top 10 is another lightweight compact fold stroller. Measuring 39.5 x 15.5 x 39.5 inches, the Zoe XL1 BEST v2 weighs just 11lbs and comes in two color options. This stroller has one of the lower weight limits in our Top 10, however, as it can only hold a child weighing up to 40lbs. The seat on this stroller is great for those toddler naps! It fully reclines into multiple positions and the seat is a good height for taller children. 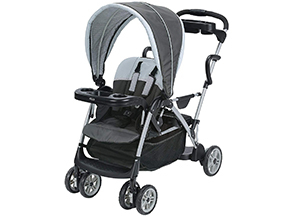 One of the biggest selling points of this stroller and one which comes up often in reviews is its excellent canopy. It almost covers the whole body of your little one, meaning she is protected from the elements whatever the weather. The 5 point harness has straps that click together in such a way that it is easy to get your child in and out whilst feeling very safe and secure. 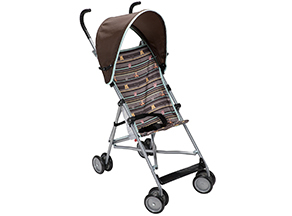 As with many other strollers in our Top 10, the swivel wheels are lockable and the stroller is easy to fold. Ever been in the position where you’ve put your diaper bag on the handles of your stroller and witnessed it tip up when you removed your child? You’re not alone! One of the great things about this stroller, however, is that it doesn’t tip! This is also a good thing for making the most use out of the cup holders on the stroller. You definitely don’t want a stroller to tip if you have a hot drink! Whilst this is the most expensive product in our Top 10 with a price tag of around $230, it has over 750 reviews and an average rating of 4.3 meaning it is a popular choice amongst parents. With a few adaptations (e.g. wheels removed), it can be stored in an overhead bin on an airplane. The biggest attraction for me with this product is its canopy. If you live somewhere sunny or frequently visit hot and sunny places, then you won’t be disappointed. The downside of this product is its cost. However, the reviews show that customers are happy with it, meaning that it is money well spent. This Disney Stroller boasts of an extremely lightweight frame that’s easy to fold yet unbelievably robust and durable. It’s also very lightweight on the pocket, as it is very cheap and easily affordable at $25, which makes it one of the top selling strollers out there. Despite being available in this one color option, the cute Disney design will surely appeal to your child. This stroller has the following dimensions: 40 x 6.3 x 5.4 inches and it is the lightest product in our Top 10 at only 8.05lbs. Having said that, it can securely hold a child weighing up to 40lbs, meaning its light frame is robust and strong. The basic design of this stroller means the seat fixes into place and does not recline. There is a standard canopy that can open and close, which for the price of this stroller, does the job reasonably well. All the wheels can lock into place and the stroller can be easily folded into an umbrella fold with a sturdy locking system. The downsides of this item are that the handles can seem too low for taller people, although they are comfortable and nice to hold. Also, it is only available with a 3 point harness and not the 5 point harness that most of the other strollers in our Top 10 have as standard. Its basic price means that you get what you pay for – there is no storage on this stroller, although you can buy a storage bag that attaches to the handles. There is a footrest, however. This product is the most affordable in our Top 10 Baby Strollers Review and is in fact, the cheapest product out of the 21 we reviewed at around $25. Despite its low price, the stroller has an average rating of 4/5 from over 600 reviews, meaning you won’t be wasting your hard earned cash! Perfect for a family holiday or for occasional use, this umbrella stroller is very affordable. It is lightweight and doesn’t take up much space when folded so can easily be kept in the trunk of the car for convenience. Chicco’s stroller boasts of a quick-release fold that lets you single-handedly manipulate the stroller to make it ready for use. Bonus features include a carry bag with shoulder strap that makes it easy to carry everywhere. This tandem stroller has 12 different riding options and can take children of various ages meaning it is one of the most versatile products in our Top 10. Weighing in at just under 34lbs, this double stroller measures 24 x 44 x 41 inches. The maximum weight limit for the front seat, bench seat and standing platform is 50lbs and the rear seat can hold up to 40lbs. If you prefer fabric that has a softer feel, the seat material is made from 80% polyester and 20% cotton. There are two color options, Gotham and Glacier. The former is darker whilst the latter has a lighter gray trim. There is a removable rear seat that can parent-face for interaction with your baby. This is the only stroller in our Top 10 Baby Strollers Review that has a full-sized rear-facing seat. The front seat reclines completely for comfort during naps. There are two standard canopies with this stroller, which offer good sun protection. You’re dealing with two children as well as a double stroller – not an easy task! With a one-hand fold, this stroller provides a convenience that is unusual with double umbrella strollers. Once folded, the stroller locks into place and is free-standing. There is a 5 point adjustable harness on both seats. The wheels swivel, are lockable and have suspension. With two children there is often double to amount of things to take out on a day-to-day basis. The extra-large storage basket is perfect for carrying everything you need for two children. Other additional features include a parent tray with cup holders and a child’s tray that is removable. At around $133, this is the 3rd most expensive stroller in our Top 10, however, with the number of seating options, it is almost like purchasing more than one stroller! A manufacturer’s warranty is available too. In terms of reviews, this product scored the lowest in our Top 10, with an average of 3.8 out of 5 from over 350 reviews. However, new reviews appear frequently meaning customers are choosing this product over other similar products. Despite its lower rating than other strollers in our reviews, this product makes it into our Top 10 Baby Strollers Review because of how versatile it is with its seating options as well as the additional features and extra-large storage basket. This double stroller from Graco is versatile and offers multiple seating options for two kids of different ages. It has a front seat and rear facing seat, and features a single-hand fold mechanism that allows it to be manipulated easily. Our number 10 choice in this Top 10 Baby Strollers Review is a complete travel system, which can be used in six different ways. The frame measures 25.5 x 34 x 74 inches and weighs 38.5 pounds, making it the heaviest stroller in our Top Ten. Don’t let the weight put you off, however, this is a very robust stroller that is made to last. The Eventflo Pivot can carry a baby weighing as little as 4lbs up to a maximum of 35lbs. The stroller itself is designed to take 50lbs, so you still have all that necessary weight allowance for your storage. 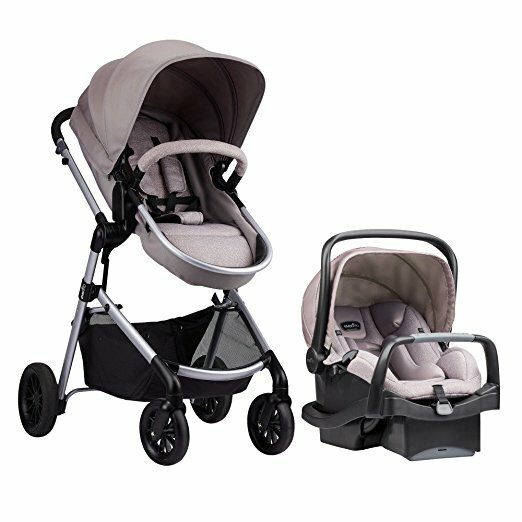 There are 3 color options and the stroller itself looks very stylish and elegant. This stroller is designed for comfort in mind, whether you have an infant or toddler. The handle is ergonomic, making it comfortable for the parent too. 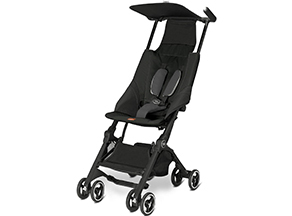 This stroller offers great flexibility in seating position as your baby can face in or out. The rear facing height of the stroller seat is 17 to 32 inches and has multiple recline position. Each element of the travel system (the carrycot, car seat and seat unit) has an excellent canopy providing protection from the sun. The car seat has a head support for infants and there is also a cover for colder weather with the carrycot. Overall, it is a very comfortable stroller. Are you often in and out of the car running errands with your baby? The car seat moves from your car to the stroller with ease and it clicks into place securely. The safety harness can be both a 3 point and 5 point harness for added flexibility. The manufacturers have really thought about the wheels on this product. Not only do they look elegant but the rear wheels are oversized, making the ride easier and more comfortable. The stroller closes to a compact fold making it easier to transport. This stroller has so much space in the storage basket that you can take everything you need and still have room for shopping! There is a removable cup holder for parents and a removable tray and cup holder for your child. Whilst this is the most expensive product in our Top Ten, you really do get a lot for your money and don’t have to think about buying a separate car seat! Customers rate this product highly too. The average rating is 4.4 from 200 reviews and over 70% of them are 5/5. Expensive but you get a lot for your money and wouldn’t need to purchase anything else for your transportation needs! This is also a really stylish product. As an essential purchase for your baby, you will want to make sure that your stroller is kept in prime condition for it to be a long-lasting investment. Properly caring for your stroller will keep it in great condition and will keep your baby safe, secure and comfortable for years to come. You need to look for tell-tale signs of degradation and address the issue in order to provide the best experience for your baby. Let’s look at the wheels first. If the wheels begin to make squeaky noises, it’s best to apply some grease. Not only will this ensure your baby naps peacefully, but it will help maintain the wheels and limit wear and tear. Children can be messy, especially if they eat or drink in a stroller so it is important to clean the canopy, harness and the seat frequently. It is simply a case of a quick scrub and wipe, then dry. For especially dirty parts, you can use diluted detergent and then wash it and wipe dry. If your child has dust allergies or such, this step is an absolute must. For the stroller frame, wipe off the marl, then use a damp cloth to clean, before wiping with a dry cloth. Not drying the stroller will cause it to age. You should not use a bleach for toxic products when cleaning. Follow the manufacturer’s instructions when cleaning. Put the seat cushion to dry outside in the shade, do not use a tumble drier. Fabrics and plastic are prone to fading, so to keep your stroller looking like new, avoid leaving it out in direct sunlight. Finally, tighten the screws and recheck the connections every few days if the stroller had to be assembled. For preassembled strollers, this step might not be necessary. Before you head out to buy a stroller, it’s best to do some research. This complete guide with the Top 10 Baby Strollers Review should have provided all the information you need as you know that here at Stuffoholics, our reviews are accurate and unbiased. It can definitely be informative to read what customers are saying in their online reviews, whilst bearing in mind there may be some bias. Additionally, it is always a good idea to go to a store and try out the stroller you’re considering to see if it feels right for you, particularly if you’re above average height. If you’re still undecided after reading all of our reviews, take a look at our report to find out more about the products we reviewed. Alternatively, our Top Pick is an easy choice that you can trust. We can guarantee that you’ll be satisfied with the Summer Infant 3D Lite Convenience Stroller, it has everything you need and in an affordable price too.